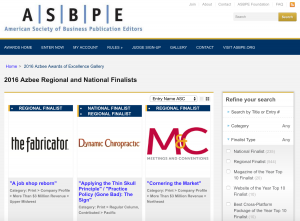 ASBPE congratulates all the finalists of the Azbee Awards of Excellence competition! This year more than 1,150 entries were received and more than 90 experienced B2B editors and designers assisted with judging the more than 75 categories of entries. For the first time, ASBPE has compiled this year’s finalists into an online photo gallery showcasing the finalists, including each entry’s submission essays and copies of each entry. Awards are given both regionally and nationally in the Print, Online, and Design divisions and given nationally in the three Overall Excellence categories: Magazine of the Year, Website of the Year, and Cross-Platform Package of the Year. The level of regional winners — gold, silver or bronze — will be announced at regional banquets across the United States starting in June 2016. National gold, silver and bronze winners and the Overall Excellence winners will be announced at the National Azbee Awards of Excellence banquet, held in conjunction with the 2016 ASBPE National Conference at the Poynter Institute on July 21, 2016. Learn more and register now for the national conference and banquet.